Nowadays there are paranormal investigators in just about every town! There seems to be a wide-spread growing fascination for “the other side”. It’s not so strange that so many of us are intrigued by such a thing…why wouldn’t we be interested in a “place” (more a sphere of existence than a place) where every single one of us will eventually end up? Honestly, I don’t understand why there hasn’t been more widespread interest before now. Interacting with the spirit world should be a NORMAL thing to do, not a PARAnormal freak thing!! What better comfort are we going to get when we lose a loved one to “death” than to speak to them once they’ve “crossed over” (a common term used to describe the transition from physical to spiritual existence)? What else is going to ease the pain of loss than KNOWING that our departed loved ones are “alive” and well and HAPPY? Seriously! My paranormal adventures began when I moved into a haunted house when I was seven. It took us a while to figure out what was going on. Being the oldest of five kids, I was often blamed for the lights being on when my parents specifically remembered turning them off, or for leaving the doors open when they were supposed to be closed. Now, I have to tell you, no WAY would I have felt safe going to bed (in my tween years I was often the last one to go to bed) with the front, cellar and barn doors wide open! Our house had a huge old barn attached to it (a great place to play during the day, terrifying at night). As for the cellar…all of us kids were afraid of it. There was a room down in that dark, dank place that looked just like a vaulted tomb! I think bodies used to be put in there until they could be buried. I tell you, for the first five years or so of living there (up until we realized that otherworldly entities were the culprits), the five of us kids got blamed for most of the ghosts’ shenanigans. I can’t tell you how often we were called to the carpet because of something that had gone missing (Dad’s tools, mom’s things). When you live in a haunted house…a LOT of things go missing. I have to wonder about this. Why? What use could a ghost have for our physical objects? Where do the things go? SOMETIMES we’d find them in some out-of-the-way place that wasn’t even logical for them to be and most times? Never seen again. Why, I remember one time when my parakeet (cage and all!) went missing for a whole freaking week! Then one day, it just showed up…food and water dishes full, cage clean (do you know how messy a parakeet is?) and as for the bird, well he looked fat and happy. What the heck? Where on earth did he go for that week he went missing? My father often got blamed for the times our poor terrorized dog went crazy. Since we didn’t know about the ghosts, it seemed logical that it had to be his fault whenever we saw poor little Tippy go running off yelping in fear, tail between his legs, ears flat, and eyes flashing with terror. As for the house, well the constant cold was blamed on the fact that it was an old building. No matter that when it was 90 degrees outside (very hot for Maine! ), the house would be cold enough to warrant a sweater! The electric appliances going crazy…turning on or off at will…was blamed on the wiring. Really, those first few years, there was a LOT of blaming going on. It wasn’t a great situation for our family to endure. The negative energy in that house was terrible. I hated all seven years that I lived there. The night we moved out, I had never felt so relieved in my life. BUT (there’s always a “but”) that very same evening while my brother and I sat together in the living room watching television and enjoying the fearless feeling of being in a ghost-free house, the dang blender on the kitchen counter came on full blast!! Dadgum ghosts…you can’t get rid of them. They are literally everywhere! Yet for all that…the fact that ghosts are everywhere, there are a good number of people in the world who have not encountered one! Well, I’m willing to bet that a good majority of them have, in fact, encountered a ghost but they chalked it up to being something else. We are great ones for rationalizing the unknown or unexplained away. It’s the very thing my family did those first few years! You want to meet a ghost? Be open to meeting a ghost. Invite them to interact with you. Stop calling yourself silly names for doing it! The fact is, interacting with the spirit world is not a joke so don’t treat it like one! At the same time, don’t be so overly serious about it either…loosen up, have some fun! When you are having fun, your inhibitions are lower and thus the resistance to allowing a supernatural experience is also lessened. Fear is our worst inhibitor. For everything. Fear is the one emotion we all have to learn to conquer. When we can finally live without fear, then I think our time here on Earth is done…maybe we can move on to bigger and better things in the next life! One of the most profound quotes I’ve ever heard is “Be not afraid for I (the Lord) am with you” (Isaiah 41:10). And yet we fear. We doubt. It seems to be part of our earthly nature to experience those two emotions. Interestingly enough, last night I had a dream that I was on a ghost hunt. As we entered the haunted house, I started feeling strange (almost like I had a pretty good buzz going!). I KNEW that spirits were about and wanted to communicate with me. I told myself to go with it, to allow whatever was happening within me to happen. I was concerned about what the others would think but I told myself not to worry about it (something I have to wrestle with…worrying about what other people think). It felt as if I was floating (not just my spiritual body but my physical body as well), though I couldn’t be sure for my focus was on all the spirits in that house that started talking to me. I wasn’t scared, I was fascinated. I tried to share with the others what was happening but they all looked at me as if I’d gone off the deep end. When I finally snapped out of the trance-like state I was in, the others walked away from me with an attitude that I was to be avoided. I just conversed with the ghosts they were there to hunt and no one was the least bit curious to know what had just happened to me or what I learned. First thing I thought upon wakening was that if I were to truly experience something like that, anyone with me would probably respond as the people did in my dream! I believe that dreams are messages to us, a way for our soul to converse with our earthly personality. I think that dream was telling me that if I’d stop worrying about what other people think and stop being afraid of the spirits that want to talk to us, I’d probably have some pretty profound supernatural experiences! You see, during the dream, I decided not to be scared of the feelings coming over me. I’ve stopped myself in the past from experiencing something unusual because I was afraid. It’s most frustrating for me because I don’t WANT to be afraid. The good thing is, I’m better about conquering that dratted emotion. I still have my fears but they number fewer than they used to! I think we are more apt to be aware of ghosts and spirits when we let go of our fear and inhibitions. 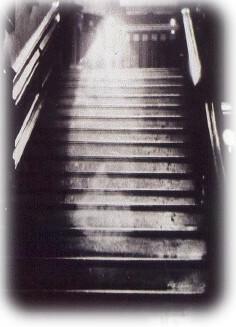 Although people who go on ghost hunts are hoping to “find” a ghost, the fact is, deep inside, they also fear it. Not all of them, of course, and those are the ones who DO experience something! Another thing that keeps people from experiencing ghostly contact is their expectations and their egos. The best thing to do if you are serious about contacting “the dead” is to let go of your fear (proper preparation will help ease fears…see my previous post 5 Steps to Spirit Contact), let go of your inhibitions – loosen up and have some fun…just “go with it” and try not to have any expectations. It’s hard to experience something if you have it set in your mind what it is you are supposed to experience and HOW you’ll experience it! Also…be sure your intentions are clear. WHY are you wanting to make contact? That’s an important question. Simple curiosity is not going to cut it. The spirits are not looking to connect with curiosity seekers…to them, making contact with us is a serious issue. It’s as much a profound experience for them as it is for us. Having fun with the experience doesn’t mean making jokes about it…it means enjoying the experience while at the same time taking it serious. Because I am so fascinated with spirit contact and have had so many awesome experiences, I wanted to write a story that included these things. That’s how “Be Still, My Love” and “Hidden Voices (the sequel to be released soon!) came to be! Many of my experiences show up in those two books! Those are the best stories to write…the ones that you can relate to in some way. They are also the best ones to read!! Okay, that’s it for now. If you have any questions, please ask away! If you have anything to add to help others in their quest to meet ghosts…please do!! Thanks for stopping by and until next time…blessings to all and Peace Out! Your blog has been added to today’s A.D.’s FAV 5 of the A to Z Challenge, I already follow your blog and my topic today was for the letter G. G is for Ghost Hunters And Ghost Adventures, your’s went right along with it and I had to add! I am honored! Thank you so much!! I’m one of those paranormal investigators/researchers who never really grew up with a lot of paranormal experiences, but I know they’re there and sometimes I wish I grew up in a haunted house. I know… that’s easy for me to say that. I have had a few “knockers” come visit me recently with some of my EVP experiments. I wish more would actually talk. Maybe I’ve read too much about the Fox sisters. 🙂 Nice blog! I’ve lived with one, and we got along real well. I only wish they she had been a conversationalist. I like you have a lot of questions and probably do just as well without the answers. Thanks for sharing Deborah. I definitely feel that it’s fear that holds me back from a lot of things, especially when it comes to the ‘paranormal’. I’ve always thought I’d love to contact the other side, particularly to talk to people I’ve lost but I’m just too scared to actually do it. « An Interview With Paranormal Author Cege Smith!